From time to time I've got the pleasure to participate in challenges organized on my favorite craft blogs. As most of us I enjoy a bit of inspiration and a dose of challenge - it gives me a good kick to start my project:) Maybe you will join the fun and play with us too? 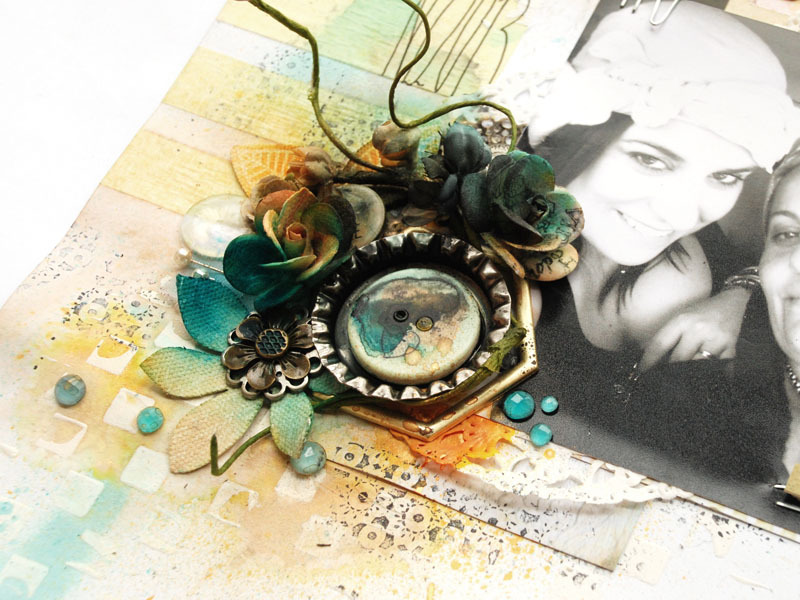 First of all - here is a layout I made for Prima Build-A-Page challenge this month. The Sketch was lovely... and I had to make it "my way, I simply couldn't help myself! 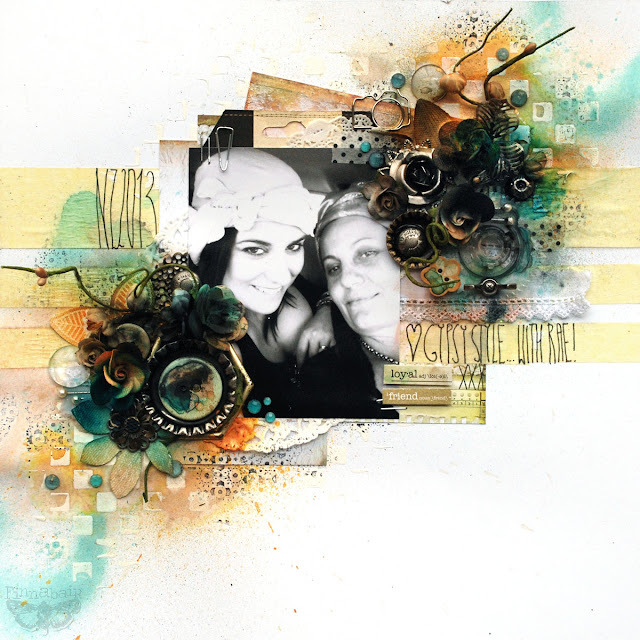 Project is based on Prima Sunrise-Sunset paper collection, Resist Canvas flowers and leaves, Prima paper flowers and vines, Junkyard Findings and my Mechanicals. The second project is my Mixed-Media Journal cover - and I made this as a part of the challenge on Mixed Media Place Blog. This month we focus on acrylic paint - and my choice were Silks from Luminarte - beautiful, shimmery, vibrant paints I use all the time in my projects! 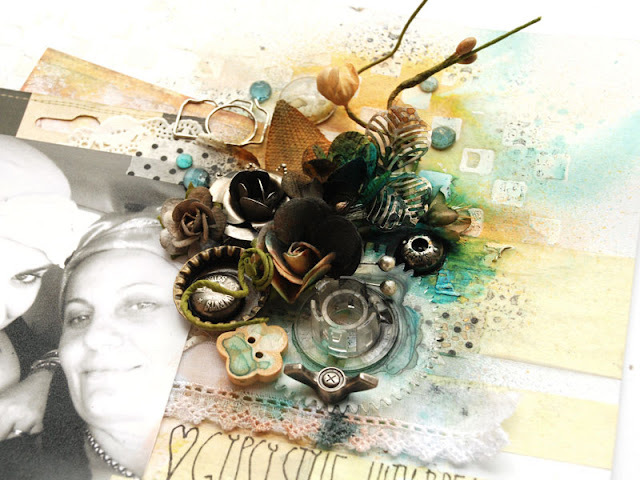 The cover of my journal was of course decorated with one of my stencils, some flowers and Mechanicals - my metal embellishments from Prima. The colors I used are from Emperor color set and Empress color set. You will find more details about both challenges on the blogs I linked above - I hope you will join the fun and play with us! Have a great creative day! I love your art!! A wonderful LO and great work!!! Beautiful, do you know who wholesales Luminarte Silks in UK/Europe? Hi, I know... that nobody.You have to order them directly from them! Oh My! These are both fabulous and scrummy! Stunning work for sure! I LOVE the journal cover, what vibrant colors. Stunning! Your color choices are just wonderful. Thank You for the close up photos. Let's me see what mechanicals and goodies you used. Love your art. Golly Gosh - i have seen nicer pics of me - not sure i pull off the Gypsy thing that well - but boy oh boy was it fun - neigh, neigh lol......... gorgeous creations yet again !! A stunning book cover! I looove it!